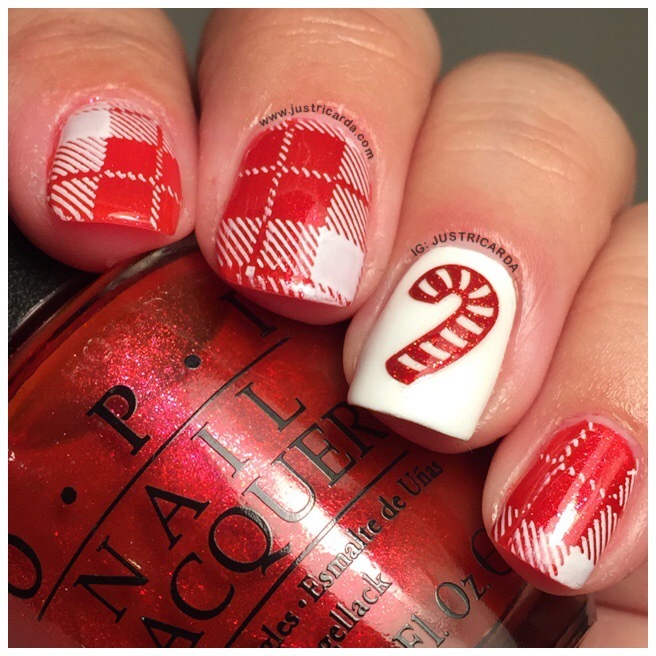 In this Glitter Christmas pack, there’s these gorgeous glittery red candy cane vinyl nail decals. These candy cane decals are just the right size! They’re approximately 10mm down and 6mm across. There’s ten candy canes in this pack (there’s also silver reindeers and green Christmas trees as part of this glitter pack). Application was a breeze! Like my prior experiences with Vinylsaurus Rex, there weren’t any issues applying these candy canes to my nails. I used a tweezer to peel it off the sheet and applied it directly on my nails. I wanted to pair up this candy cane on my accent nail with some glittery holiday red plaid patterns on my other nails. It’s the perfect combination! I can’t wait to show you the other decals in the next few days!